I recently had a conversation about the Harry Potter books and why they were so much better than the more recent young adult series that have spawned franchises (think: Twilight, Hunger Games). Someone pointed out to me that the Harry Potter books seemed to grow in maturity as they went along. It makes sense - 10 years pass between the publication of the first and last books, and Harry ages 6 years. The fact that the writing and the story lines seem to keep pace with Harry's maturity speaks volumes about J.K. Rowling's talent. It's also why the books remain interesting, even though each one seems to grow equally in length. So what does Harry Potter have to do with this movie? A lot, actually. For anyone not familiar with the Before series, the movies don't come out on the heels of one another, making the general public sick with the over-saturation of its characters (again, think Twilight). When Before Sunrise was released in 1995, there was no indication that there would even be a sequel. So when Before Sunset came out in 2004, it was both surprising and exciting. (And terrifying - everyone know sequels are generally a disappointment.) It was also the only sequel I've ever liked more than the original. It was worth it. Like those Harry Potter books, the topics in the film grew up and related to an audience that had maybe grown up alongside these movies. It gave a lot of the familiar and beloved aspects of the previous movies - beautiful scenery, dynamic dialogue, and large portions of real-time action. It truly is amazing how watching two people just talk can be so interesting. 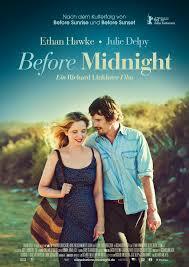 Some people may find it boring, but I think this makes Richard Linklater a genius. It's like watching a play but with way better set design. Final word: Satisfying for fans of the previous movies in the series. Skews more toward a slow dialogue about relationship issues for those who aren't. Watch the series from the beginning - it will help add context for the subsequent movies.